Maria.B is Pakistan’s most diverse designer brand, with a proud collection of East-meets-West fashion apparel. The company has an extensive retail network comprising both standalone and mall outlets in 12 cities across the country, and exports to international markets. Maria.B’s objective was to increase brand awareness in the UK, US, Canada, and Australia, as well as increase purchases from international markets. Maria.B’s popularity was increasing and so were the cross-border opportunities. 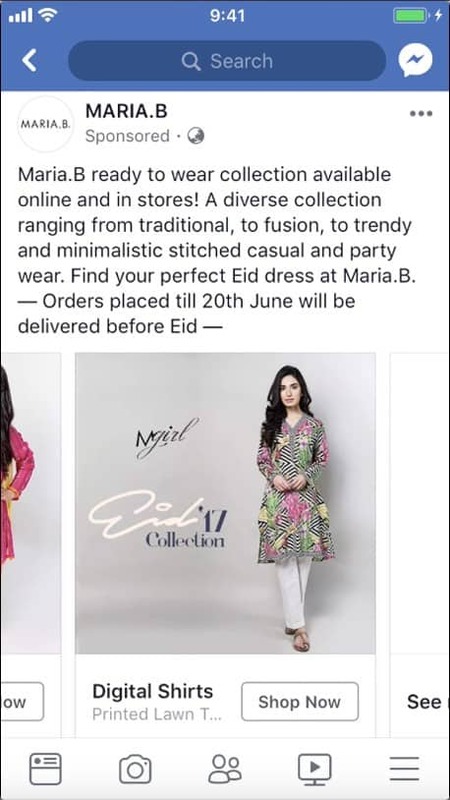 So, the brand decided to run a Facebook campaign to grow its international market at an opportune time – the Eid shopping season. First and foremost, Maria.B ran a video ad to create awareness and excitement around its product launches for the impending festive shopping season. The interested customers could then click through to find out more about the featured apparel on its e-commerce site. The retailer installed the Facebook pixel on its website to track events and gather insights about its customers. From the data, it optimized the performance of its photo ads in the carousel format by showing several top-performing designs. In addition, the rotating carousel format also effectively showcased multiple new products as they launched to cater to the increased demand over the peak shopping period, as well as the varying tastes and preferences of the international audience. To target the most relevant audiences globally, Maria.B built a Custom Audience of its past purchases, then created an international lookalike audience based on them. Moreover, it targeted the ads to people interested in other Pakistani fashion brands to ensure it would reach audiences most likely to make purchases. The company used Facebook Live to create buzz around its upcoming collections and fashion shoots, further capitalizing on the festive hype of the season for increased sales. By using automatic placement to run ads across the Facebook family of apps and services, Maria.B also maximized reach and boosted results. The fashion retail company saw a 71% increase in international sales.